Do you believe soups are better suited for a specific time of the year? Maybe when it is cold and dreary or rainy outside? 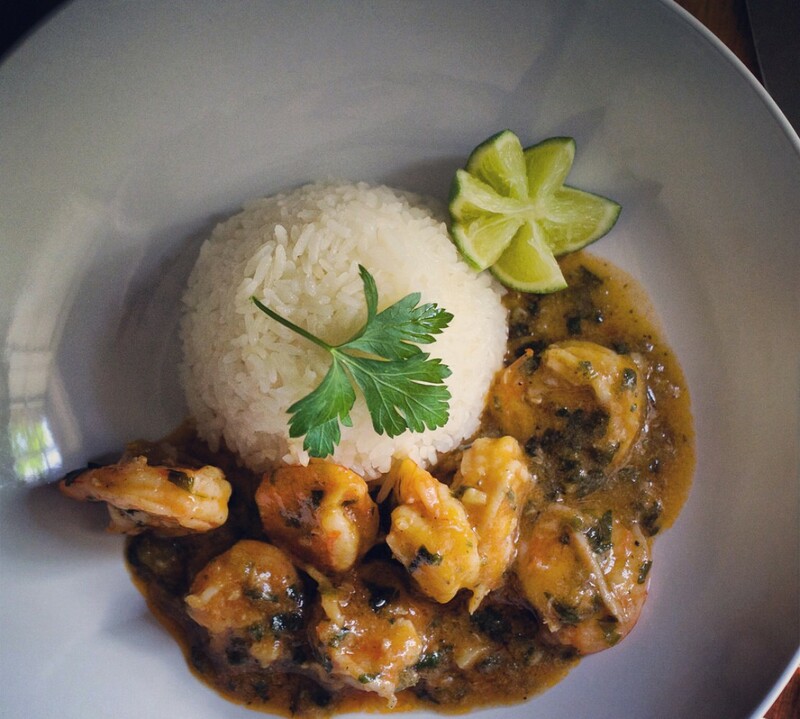 For Panamanians, soup is on any day of the week and year. As a matter of fact, you’ll find it on the daily lunch menu at every restaurant or Fonda around the country. When I was in Austin a few weeks ago, I saw an advertisement for Sopa de Arroz con Pollo (Chicken & Rice Soup). Even though I’ve heard about chicken & rice soup, I never really thought about it in a Latin context until then. 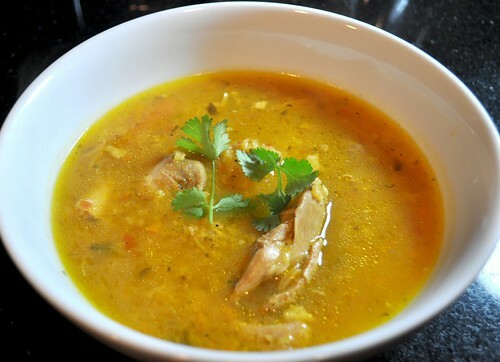 Chicken & rice soup doesn’t move me in any way, but Sopa de Arroz con Pollo…? Now, that’s a completely different matter. I simply couldn’t get it off my mind. The possibilities. The potential goodness. Muy rico. It turned out lighter than I had anticipated, even with the addition of the rice. Rich with the flavors of the chicken broth and culantro. I didn’t have any yuca at home, but next time I make it, I will use that instead of potatoes. And it was a breeze to make too! 1-1/2 lbs of chicken on the bone (I prefer thighs) seasoned with 2 pkts Sazón Goya . To your blender, add 1/2 onion, 1/2 red bell pepper, 1/4 cp cilantro or 3 culantro leaves and 2 crushed garlic cloves, add just enough water to puree all the ingredients; I ended up with about 3 cps of puree. Put the seasoned chicken and the puree in a stockpot over medium-high heat and allow it to cook for about 10 minutes, stirring occasionally. This will allow the flavors from the pureed veggies to infuse the chicken before adding all the water for the soup. After about 10 minutes, add enough water to totally submerge the chicken, about 6 cps, add some chopped potatoes and carrots, season with salt & pepper, and 1 bay leaf. Bring it all to a boil, then lower temperature to allow it to simmer and cook for about 20-30 minutes or until the chicken is tender. Remove the chicken from the broth and add 1/2 cp of rice to it, allow it cook while the chicken cools enough to remove the bones. Make sure to stir the broth every few minutes, making sure to remove any rice that may stick to the bottom. In the meantime, chop the chicken, if you’d like and return it to the broth. Cook just long enough for the rice to soften. Serve in bowls and enjoy! In Puerto Rico they do all kinds of asopao. They are less soupy than yours but a lot wetter than traditional arroz con pollo. A nice finishing touch is a squeeze of fresh lime juice. I’m not a soup person, but this sounds delicioso, and simple to make. Right up my alley I will have to try this one.